Benmore Botanic Garden, one of four gardens of the Royal Botanic Garden Edinburgh RBGE) is a dramatic mountainside garden, renowned for its collection of flowering trees and shrubs and a diverse range of conifers. The first phytogeographic plantings at Benmore started in the 1980s with the Tasmanian Ridge, followed by the Bhutanese Glade. The Chilean Rainforest area was developed from the mid-1990s. The most recent plantings form the Japanese Valley. All the phytogeographic areas contain more than 95% wild-collected material. 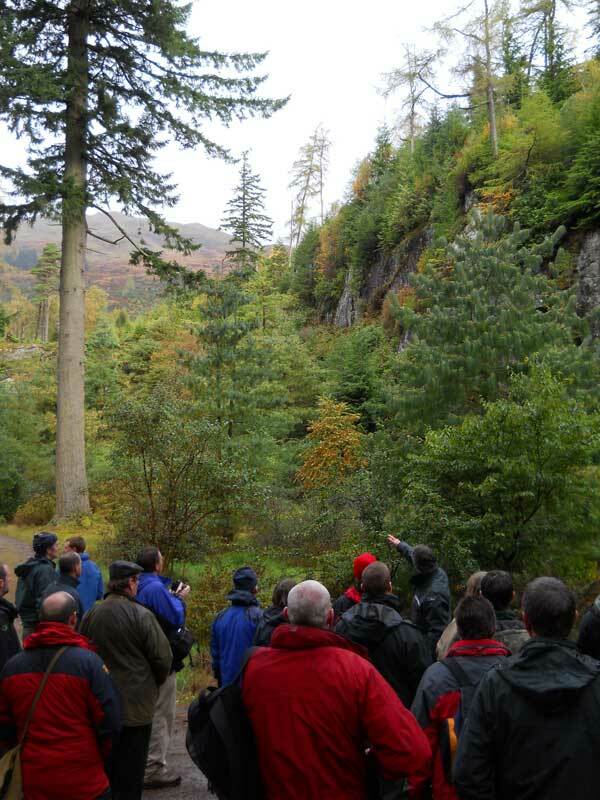 This meeting of the Tree Forum, 20 delegates enjoyed a tour of these plant collections with Peter Baxter, Curator, along with discussion on their establishment – successes, failures and lessons learned. Maintenance, development and timescale of the areas were considered and how best to interpret phytogeographic plantings. There was a short visit to the recently restored Victorian Fernery, planted with a collection of unusual ferns. In recent years, plant conservation has become a core objective for many botanic gardens. 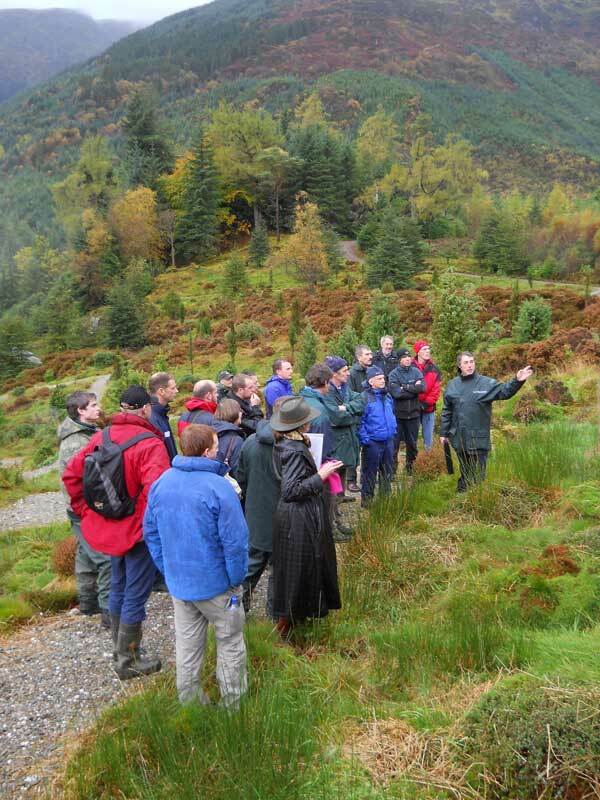 This is being delivered in a number of ways, including the planting of rare species and raising public awareness of the importance of conserving plant species and whole communities. 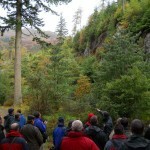 The day at Benmore was an excellent event run by Peter Baxter and his team. In particular, we were looking at their work on plant communities from different geographical areas. 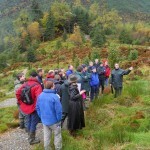 After a brief introduction to the background of this unique site, Peter lead the group into the Bhutanese area, which contained plants such as Pinus wallichiana, Larix griffithiana and Abies densa. As we walked up through the garden, we saw a representation of species from different altitudes, until we reached the summit of the steep climb. This took us to the recently formed Chilean Glade. Although this is a young collection, there was a good range of species that were beginning to establish well. Plants included Fitzroya cupressoides, Araucaria araucana, and Desfontainea spinosa – in flower. Some good discussion was had on access difficulties and the use of different interpretation methods, such as panels, guides and themed tours. This was highlighted by a video presentation developed for people who could not get access to the rebuilt Fernery. The tour continued through an area of Japanese planting, where there was some discussion on the spacing of plants as we looked at a grove of Cryptomeria japonica. After a short stop to admire the restored Fernery, we continued on to Tasmania. This area is most interesting to us from Bedgebury as we had supplied some of the plants to RBGE, such as Phyllocladus aspleniifolius and athrotaxis selaginoides. These were establishing well, and, hopefully, in a few years time the vision will start to take shape. As always, the day was complemented by the chance to catch up with other members and to make new contacts. Discussion could be heard throughout the day including different collection methods and types of equipment used. It was apparent that many other people had taken the time to tour other gardens in the North, such as Ness, Dawyck, Edinburgh, Kilmun and Arkinglas. The meeting was wrapped up with thanks to Peter and his team for an excellent day, and future PlantNetwork days were highlighted.